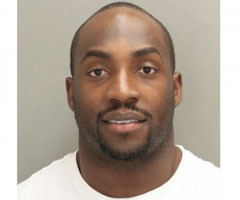 Published: July 16, 2012 at 10:10 a.m.
Miami Beach police detective Vivian Hernandez confirmed to NFL.com and NFL Network on Monday that Denver Broncos outside linebacker Elvis Dumervil was in fact charged with felony aggravated assault with a deadly weapon Saturday night in Miami Beach, Fla. Previously, it had been reported that Dumervil had just been arrested and not charged. The charge -- and the details released to NFL.com and NFL Network on Monday in a police incident report -- increases the chances of Dumervil facing NFL discipline at some point. UPDATE: Terry Chavez, spokesperson for Miami-Dade state attorney Katherine Fernandez Rundle, told NFL.com and NFL Network that Dumervil's arraignment is scheduled for Aug. 13 at 9 a.m. ET before judge Darrin Gayles. The state attorney's office will have until that time to decide whether or not to file formal charges against the Bronco. The report indicates that Kristine Ramirez and her husband, Juan Cardoza, got involved in a traffic dispute with Dumervil and Andy Aguste after Cardoza merged in front of a vehicle that Dumervil was driving. The traffic was at a standstill, and the report -- verified by another witness -- indicates that a verbal confrontation occurred between the parties. Dumervil allegedly approached Ramirez's car and lifted up his shirt to show a gun in his waistband. Aguste allegedly did the same -- displaying a gun -- while also verbally threatening Ramirez. The report then indicates Ramirez backed up her car in an effort to retreat and get away from the situation. Police arrived shortly thereafter and led Dumervil and Aguste out of their vehicles at gunpoint. The officer placed Dumervil in handcuffs and asked if there were any weapons in the car. Dumervil said "No," but police discovered a firearm in the glove compartment of his vehicle during a search. A witness told the police that Cardoza at one point exited his car and threw an object at Dumervil's Land Rover, striking the vehicle. Dumervil was cited for assault and disturbing the peace during the 2010 season, although those charges eventually were dropped. He could be viewed as a repeat offender by the NFL, which makes eventual discipline more likely.